As of version Lodgit 1.18., you cannot move, shorten or extend bookings that you have billed, or only to a limited extent. The reason for this is that according to the "Principles for the proper management and storage of books, records and documents in electronic form and for data access (GoBD)", there may no longer be any differences between the invoice-founding records (in Lodgit Desk, the booking entered in the occupancy schedule) and the invoices. You can only move settled bookings via the opened booking window by clicking on the small arrow/triangle on the right under>Rental units and selecting the rental unit into which you want to move the booking. You can shorten a posting by entering a new end date. To do this, click on the lock symbol in the open booking window either before>departure or before>nights. You are then asked whether you want to unlock the corresponding input field. 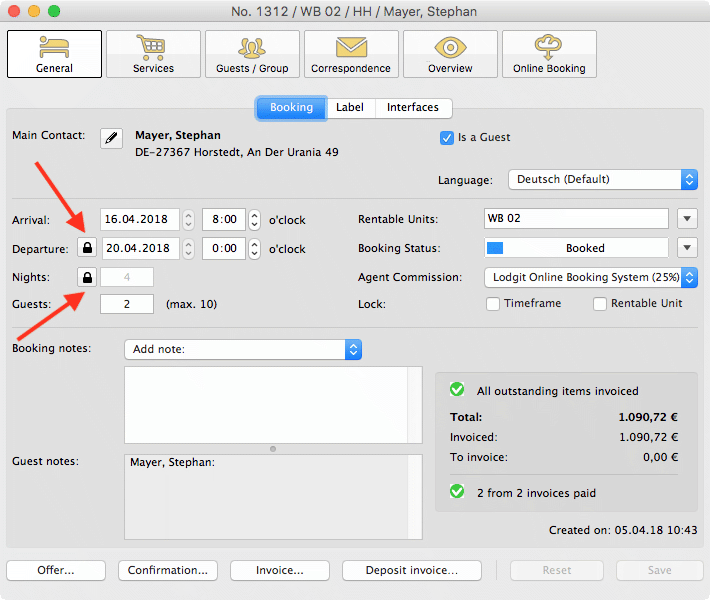 If you say yes, you can now bring the departure date forward or reduce the number of nights. Please note: If you have inadvertently shortened the booking too much and have already saved it, you cannot extend it again afterwards. You cannot lengthen bookings that you have already billed.